It feels as if just last week we watched the Kansas City Chiefs destroy the New England Patriots, a wonderful start to a new NFL season. In the blink of an eye, half the season came and went. Here we are now, in the eighth week of the season, ready to fire off these bold predictions. Is it too soon to decide who I think will win the MVP? Probably, but is that going to stop me from making an educated guess? If you were to have asked me at the start of the year, who I thought the NFL MVP would be this season, I never would have even thought to pick Carson Wentz. Alas, here I am, 7 weeks later, admitting that the Eagle’s quarterback is the best player in football this year. Wentz has made an incredible leap from year one to two. Last season, Wentz played just fine. He started the season off very well but started to cool off as the year went on. It was clear that he was extremely talented, but he needed some time to put it all together. Well, Wentz seems to have had plenty of time to do just that, as he is simply amazing this year. Through seven games Wentz has put up 1852 passing yards on a 61.6% completion percentage, along with 17 touchdowns and only 4 interceptions. These numbers, along with the Eagle’s league best record of 6-1, are extremely impressive for the second year signal caller. His numbers do not tell the full story though. When you watch Wentz play this year, you see a super hero on the field. He has done it all for his team, with his ability to make anyone who attempts to tackle him look completely silly, standing out the most. If Wentz continues to amaze everyone who sees him play, and the Eagles continue to win, he will undoubtedly be taking home his first MVP. It pains me to think that Kareem Hunt won’t win this award, as he has done everything he possibly can to do so, but he has the misfortune of sharing a rookie year with one of the best young quarterbacks in the league, Deshaun Watson. After years of complete incompetency at the position, the Houston Texans have finally found their quarterback of the future. Watson did not start the first game of the season, and had a shaky first start in week two, but since then the man has played phenomenal. After week one, it looked as if the Texans were going to be among the worst teams in the entire league, but Watson has made it his personal mission to make sure that this is not the case. He has led the Texans to a respectable 3-3, with him only losing to the Patriots and Chiefs, two elite teams. Watson has put up an impressive 1297 yards on a 61.5% completion percentage, along with 17 total touchdowns and only five interceptions. He is a near lock for the award, provided his play does not dramatically decline. Remember what I said about Kareem Hunt deserving rookie of the year, if not for Watson? In my mind he definitely gets the offensive player of the year instead. There really isn’t much to say about Hunt, he has simply been the most dominant skill player in the league this year, and it’s not even close. Hunt already has 717 rushing yards, 285 receiving yards, four rushing touchdowns and six receiving touchdowns. At this rate, Hunt is on pace to account for over 2000 total yards, and over 20 total touchdowns by seasons end. The crazy thing is, this is his first season in the league, and he is already totally unstoppable. Look for Hunt to take home this award and become one of the league’s best young stars going forward. If he keeps performing at the level he is currently playing at, this is easily Demarcus Lawrence’s award to lose. Through seven games, Lawrence has accounted for an extremely impressive 9.5 sacks. For the first few years of his career, Lawrence was touted as the heir apparent to Demarcus Ware, but he never quite put it together, that is until this season. 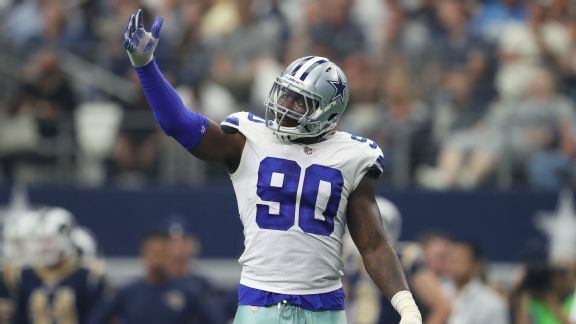 So far Lawrence looks like a legitimately elite pass rusher, and if he keeps up the pace and the cowboys remain respectable, this should be his award. The Ram’s being a good team is probably the most unexpected story line of this season, and there is one man who deserves all the credit for this team’s turnaround. That man is head coach Sean McVay. Perhaps it is as much a testament to the former coach’s incompetency, as much as it is McVay’s own coaching prowess, but McVay has taken a roster that went 4-12 last season to, currently, first place of the division at 5-2. McVay is perhaps the best offensive mind in all of the NFL, and he has proven that once again this season. The Rams are currently the top offense in football, as they have scored a league best, 212 points through seven games. Last season they ranked dead last with 224 points, in all 16 games. This dramatic turnaround is precisely why Sean McVay should be everyone’s heavy favorite to win this award. Posted in Sports and tagged carson wentz, kareem hunt, lawrence, mcvay, MVP, NFL, roty, watson. Bookmark.